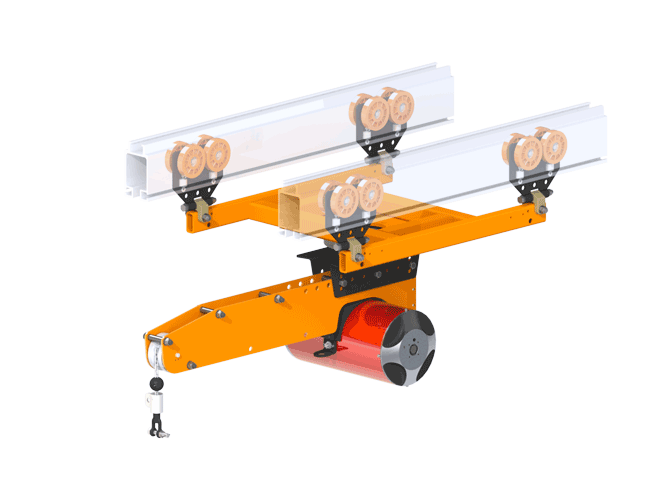 Knight’s Extension Arm Pneumatic Balancer Arm Series enables the operator to extend beyond the working limits of an overhead rail system within a workstation. 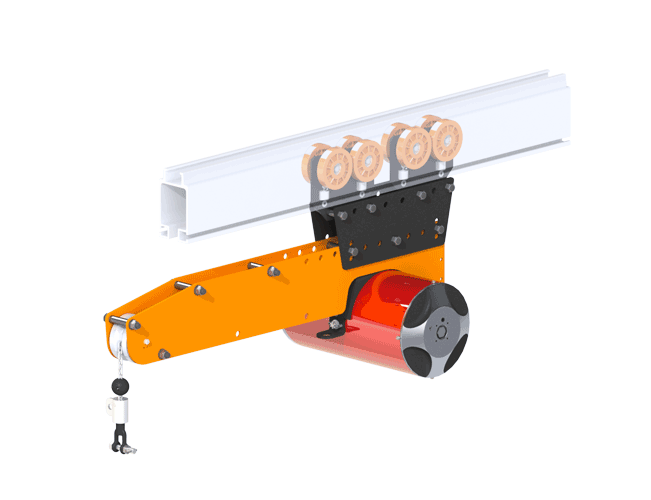 Our Pneumatic Balancer mounts to the extension arm allowing for a controlled lifting and lowering of loads. The KEAA2000 and KEAA2500 arms travel inside Knight’s RAD4110, RAD6110, or RAD7510 Aluminum Series Rail Systems. When specifying a pneumatic balancer, it is recommended for working loads to use 80% of the operating capacity for lifting applications. This approach compensates for the normal fluctuations within the plant compressed air supply. Working loads include part weight and handling device weight. Balancers are rated at 100 psi [6.8bar] therefore use the following example to calculate exact operating capability. Formula for pneumatic balancer sizing: Example: plant air 60 psi, 350 air balancer, 80% load capability (0.60 air supply x 350 lbs. = 210 x .80 = 168 lbs. operating capability). Contact a Knight representative for more information on our Extension Arm Pneumatic Balancer Arm Series. Single or Dual Bridge Configuration. Travels inside Knight’s RAD4110, RAD6110, or RAD7510 Series Rail. Angular Adjustment in 10° increments (10° UP / 10° DOWN). Horizontal Adjustments: Up to 6.8 in. [172mm]. in 2.3 in. Increments. Max Balancing Capacity: Up to 700 lbs. [317kg]. Standard Travel: See Specifications Tab. Note: Knight recommends the use of high performance, extreme pressure, anti-wear food grade penetrating oil (Lubriplate® 1241 Recommended) that penetrates and lubricates cable. For chain (SAE 50 to 90 EP oil or equivalent machine/gear oil) is Recommended. Expands the reach work area of a typical balancer. Controls Sold Separately (Up/ Down or Balance).